I first sold things on craigslist a couple months ago and last week we did our first ever craigslist purchase and pickups. They were from two different sellers, who happened to live 5 minutes away from each other, so why not just pick both of them up right?! 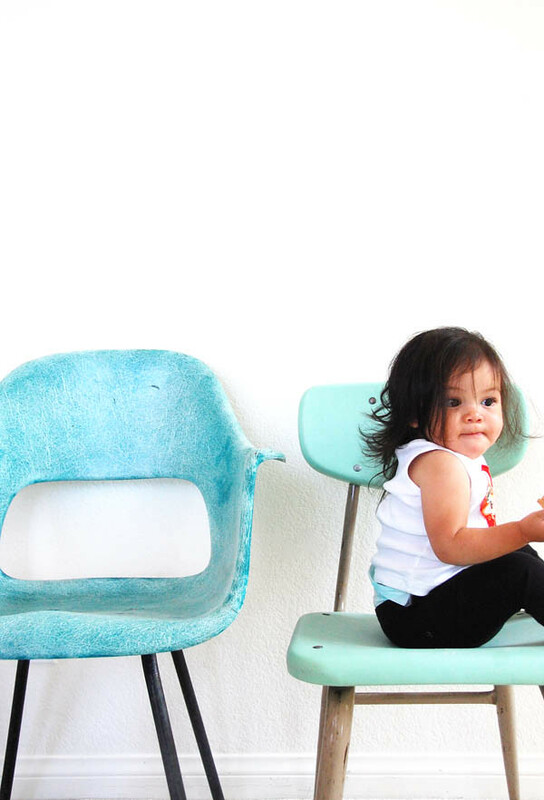 Who could turn down a vintage turquoise fiberglass chair and a pair of aqua school chairs for pretty much pennies?! Not I! The fiberglass chair needs a bit of work, so we will try out this restoration process. When all is said and done, I want to have something pretty draped on it like this chair (that fluffiness just looks so comfy cozy!). I am not quite sure where they are going to go just yet (maybe in the catch all room that holds all our messes or maybe as my computer chair), but chairs put me in a decorating mood. Okay, maybe I am already in a decorating mood because of all this nesting, but it is mighty fun (and stressful when I have to tackle the messes)! Have you ever purchased anything on craigslist? If so, tell me about it! p.s. today was a slightly better day, but i am definitely still fighting this crankiness in my heart. My husband is the craigslist pro. He has crossed about 7 different counties for craigslist purchases. After seeing those chairs, I think I am going to have to take a little peek. One summer I actually "flipped" five different sets of mid-century dining table and chairs and made several thousand dollars no joke. I was really just looking for the perfect set for our house and stumbled upon the opportunity. It took a lot of hunting for good deals and have some sketchy stories to tell - one included driving into the mountains alone to some guys house and digging out a table six chairs and a credenza from his garage for $50 but he was really creepy. I sold the credenza alone for $600 though! Have you heard of craigseasy? Makes the hunt even easier! was introduced to craigslist over 5 years ago by my hubs (to this day he wishes he hadn't). we have sold and bought so much stuff on there! it's a treasure trove for baby stuff like strollers and car seats and cribs. I get EVERYTHING on craigslist. Ive gotten almost all recent apartments and jobs as well as an amazing 1940s vanity and a mohogany sideboard. It takes some searching but there are great antique deals to be had. My next target is finding a four poster , wooden king size bed frame! Definitely! Craigslist is a great way to be green in my opinion. I usually buy kids stuff. I have sold anything from craft supplies to kid stuff on there with happy results. Only thing I get weary about is selling or buying anything worth a lot of money. There have been a lot of news reports about people being robbed over scams via Craigslist so I try to keep it a rule to not buy/sell anything that expensive and if you are picking up anything always go with a friend. i love craigslist too! we've just moved back to the states from london with only what fit on the plane. needless to say- we need lots of things. other than mattresses, we've kitted out our house with only craigslist items- and i quite like it! the people we've met have been so nice too. love your chairs- LA must have the best treasures! anastasia0 oh! a typewriter?! i have never thought to look for that. will add it to the list! welliewalks- i think l.a. is okay for stuff, if you do find something it is usually hiked up in price compared to finding something somewhere else, but if you really want it, then you gotta dish out the dough cause it might be gone right before your eyes right?! rj- i got a yellow chair too! but that is waiting for me in texas at ben's mom's house! Don't be too hard on yourself about the cranky heart...I think we all have them at times. Your little cakies know that you are all about the love! Just last week I bought a white mid century sedar wood chest with an extra drawer. I have to repaint it, but it's so cute. I recently started to look for furniture on craigslist. It's so much fun to find the one of kind piece! Btw very cute chairs. i reallly love the aqua school chair! it is so charming & that color is perfection! good to hear I am not the only one who buys chairs just because they are cool! I have two in my bedroom waiting to be recovered, but I have no idea where they will go after! My best craigslist buy may have been 4 tables for $10!! or a free.. yup FREE couch! I love craigslist finds!! I scored a vintage Schwinn that actually fits me (at 5' tall, its like finding a needle in a hay stack) as well as a road bike from the 80s. It was also the place I scored almost all my moving boxes, for free! My parents scored an awesome vintage chrome and teal dinner table and chairs, a vintage cabinet and a slew of other vintage goodness. I've sold a few things off craigslist, but buying is much more fun. Awesome chairs by the way! I love Craigslist, but be super careful... last Wednesday my best friend got robbed at gunpoint when meeting someone to buy a computer off Craigslist! It was in a public place, in the daytime, too. He was okay, but it shook all of us up. Your finds are amazing though! I've bought and sold from craigslist, but my best thrifty purchase so far was from goodwill- a lovely set of nightstands for $40! !